I don’t know about you, but I think pumpkin cookies at the holidays are an extra special MUST bake treat. I experimented with different combinations to create a healthier version. This recipe gives you healthier cookies that still contain all the WOW factor of the traditional pumpkin cookie. After several attempts and using different flours, I leaned to the oats as a milder tasting, less dry ingredient — whole wheat was too strong and overpowered the flavor in addition to making the product too dry. To get the right texture, I incorporated the white flour, but greatly reduced what would have been the full 2 ½ cups of white. Additionally, I always use unbleached white flour if I am going to bake with it. These cookies are moist and flavorful. I drizzled the tops of each cookie with a small amount of glaze. (You may want to sample them without the glaze, too.) 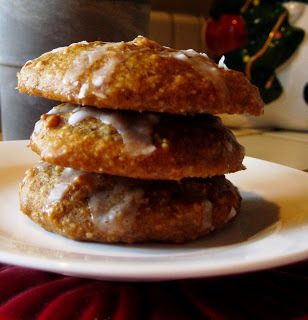 Pumpkin cookies are the perfect cookie to have for dessert, with tea or coffee in the morning, or anytime. Preheat oven to 350 degrees and oil a cookie sheet. Combine flours, baking powder, baking soda, cinnamon, nutmeg, and ground cloves. Set aside. In a medium bowl, cream together the 1/2 cup almond butter and coconut sugar. Add pumpkin, egg, and 1 teaspoon vanilla to mixture, and beat until creamy. Mix in dry ingredients. Spoon on cookie sheet by tablespoonfuls; Dough will not be overly thick. Bake for 10 to 15 minutes in the preheated oven. Watch cookies at the 10 min mark. Touch the tops and when they spring back slightly, they are done. Careful not to over bake. Cool the cookies and drizzle with optional glaze using a fork, or eat as is … great either way! To Make Optional Glaze: Combine confectioners' sugar, milk, and 1 tsp vanilla. Add milk as needed, to achieve drizzling consistency.